Hockey and home ice season is here! Many of our visitors are already up and running with their backyard ice rinks, racing across the ice, spaying rooster-tails of ice with every turn-on-a-dime. If you live in coastal regions that aren't quite frozen yet, there's still time. We thought you might enjoy this YouTube video of a dad with his very young kids on their backyard ice rink. That's starting 'em young...! 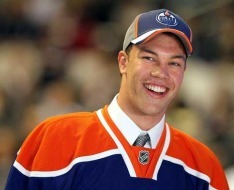 Taylor Hall, 18, is the heavily acclaimed first pick of the first round of the NHL 2010 Draft. Big goose-eggs for the first 7 games of his NHL career. And then ... a point per game in his 8th and 9th games. Taylor Hall is ... a backyard rink rat who honed his dynamic game playing for hours in the ice surface outside his back door. "It's hard to be a hockey player without a backyard rink," says Taylor's dad, Steve Hall, an ex-CFL player... "There's no question, that's where the kids learn." And Taylor has been on backyard ice since age 3, skating with neighborhood kids, including the talented T.J. Galiardi, who skates for the Colorado Avalanche. As of November 18, 2010, Taylor has 3 goals and 4 assists on his stat sheet. The future is definitely brightening for last-place Oilers. But is Taylor Hall another Wayne Gretzky or Bobby Orr? The guy is really good, but time, and lots more skating and shooting, will reveal just how good he may be. Whether you're using hockey boards or simply setting up a skating rink, we recommend using a rink liner. You could just pack down the ice in a flat area, and then flood a bunch of water over the ice. This method works great in Yellowknife. It’s cheap in materials but very expensive in labor...all year long. You can set up the rink in, say, October or November, before the weather turns utterly brutal. You can turn on the hose, and then peak out of the warm house while Mother Nature does her thing. You could be skating in 72 hours. With rink boards and a rink liner, you'll be ready when the weather is. This means a lot more skating and hockey pick-up games for the effort you put in. Ice resurfacing is a breeze. The boards and liner keep the water where you put it, reducing the time spent and helping create a glass-smooth finish. An ice melt is not the end of the season, or at least the trigger for a lot more work. Instead, the water in the liner simply waits for the next freeze, and then you're skating again. Serious hockey practice almost begs for perimeter netting. If you and your family are hockey rink rats, protective hockey rink netting could be well worth your investment, for several reasons! Safety - help prevent broken windows, pots, even teeth. Convenience - the netting returns the pucks to the ice...no hunting for hours when the last puck sails over the fence or into the bushes. Friendship - help keep your neighbors as friends by not endangering their back yard with FBO's (flying black objects). When the ice melted one spring, our neighbors on either side of us returned more than 60 pucks to us. That's $60 - $75, or more, back into my pocket! I don't think my boys broke anything of theirs when their high and hard slap shots sailed over the goals...at least the neighbors didn't bring it up...! The following year you can bet we purchased perimeter netting for our own back yard hockey rink. A perimeter netting that fits your backyard rink costs little. Purchase two of these, one for each end of the ice. Or, depending on your rink, put both at the net end. Do you have pictures and a story to tell? Contact MyBackyardIcerink - for questions and comments. Like this e-newsletter? Share My Ice with your friends!